Just as Donald Trump took office in January 2017, gospel singers Donnie McClurkin and Erica Campbell discussed the Women’s March on Washington and the rise of activism that was apparent in this country. During the interview, McClurkin stated, “America is in a place it’s never been before.” He continued, “Don’t get caught up in the protest. The protest only riles up people. Gives a false sense of involvement.” More recently, Tina Campbell, also a gospel singer and sister to Erica Campbell, reported voting for Donald Trump due to his “Christian values.” Although she described “not agreeing” with many of his actions as commander in chief, she had no regrets about her vote. This line of thinking expressed by the Campbell Sisters and McClurkin, all leading African American gospel artists, is in direct opposition to the origins of the Black church, an institution with deep activist roots that gave each their start. Organically birthed during the late 1700s, the institution known as “the Black church” was more than a place of worship. The original Black church was better defined as a psychological and spiritual refuge for enslaved Africans and Free African Americans alike. The act of worship was revolutionary for African Americans, particularly since the white supremacist system constructed by their oppressors required their spiritual liberation be halted. By deeming it illegal for African Americans to read, and even editing the Bibles utilized by African American ministers so the scriptures accommodated the institution of slavery, spirituality required courage. Following emancipation, the Black church emerged as a force in the progression of African Americans. The Black church and the pastors that led them, understood education and economic growth were forms of activism and both were encouraged within their congregations. When the Reconstruction period ended, and Jim Crow laws became the way of life, it was the Black church and progressive ministers that became the catalysts for change. 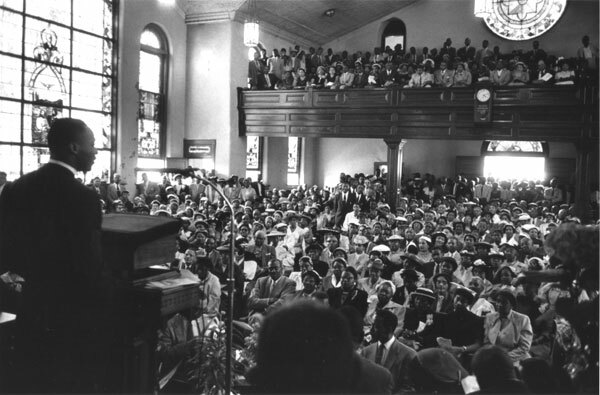 The most famous of which being Dr. Martin Luther King, Jr. During the 1950s and 1960s, the buildings that housed the Black church doubled as meeting places for the movement, with ministers and members directing its course. As it had 100 years prior, the Black church posed a major threat to white supremacy. Terrorist groups like the Ku Klux Klan and the White Citizens Council regularly bombed and burned Black churches throughout the south. From the 37 churches bombed in Mississippi during Freedom Summer to the 16th Street Baptist Church bombing in Birmingham that killed four little girls, the Black church became an intentional target of white supremacists. Despite these threats, the Black church remained a leader in the movement for African American liberation throughout the 1960s. However, during the 1980s and 1990s, a shift occurred. At the close of the 20th century, the Black church largely turned its back on its activist roots, allowing for the rise of coded white supremacy through public school and drug enforcement policies. Simultaneously, many of the most popular pastors of the day built their brands on a “Hip Hop is the devil” narrative. Black pastors walked away from the fight for justice, and instead took up the cause of vilifying rappers like Public Enemy, 2Pac, and NWA, who were the emerging leaders of the 21st century African American liberation movement. Today, the Black church has completely lost its identity, as indicated by the thinking of its most visible representatives, award-winning gospel artists. Religion is a double-edged sword that can become a weapon for the oppressor or tool of the oppressed. The comments by Donnie McClurkin and the Campbell Sisters reflects the former, and is indicative of what happens when marginalized groups rest on their laurels. With the rise of classic white supremacy, it is time the Black church get real with itself and reconnect with its roots. Waiting on any elected official to usher in liberation, regardless of race, party, or title is futile. Likewise, believing the liberation of African Americans will be realized without radical action and through prayer alone is dangerous. That insight solves the probmel. Thanks!